Last night… I organized my seed packets and collect seeds from some dried seed pods. 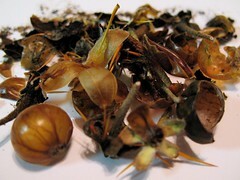 Here are the remains of the cracked Porcupine Tomato seedpods. Earlier this evening… When I got home from work, I was surprised by a yellow flower from the Elkhorn Plant that I purchased just a few days ago. 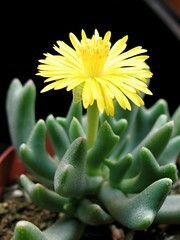 Here it is wide open, but the flower closes back at night. Recently we’ve been harvesting a lot of pears, peaches and prunes. Today I harvested more Sweet 100’s and Lemon Cucumbers. I also planted four types of seeds into newspaper pots: Grand Rapids Lettuce, Calabrese Broccoli, Catskill Brussels Sprouts and Jewel Mixed Colors Nasturtium. The seeds I planted on the 12th are doing well and I thinned them down to a couple few. I wasn’t planning on doing much gardening, but after work, I can’t help but check up on my plants. Some of the Coleus cuttings that I took on the 18th (11 days ago) are starting to root. I like to plant the cuttings in potting soil right when the root start forming, before they get a quarter of an inch. They just seem to be stronger this way as opposed to when the roots get too long. I potted 4 Tilt-a-Whirl. Tomorrow, the Kong Scarlet and Alabama Sunset should be ready to pot. My second batch of Sparkler Radish, like the first, are just not forming bulbous roots, so I pulled all of them out and placed them in the compost bin. I was able to harvest about 6 roots, which I pickled and had for dinner. In it’s place, I sowed some Hybrid Summer Boy Chin-Chiang Cabbage. I aerated my trash can compost bin (see my icon) by dumping the contents out, mixing it and placing it back in. I wheeled the Potting Soil, Steer Manure and Soil Conditioner that we bought on Tuesday to the back. The first Hollyhock just bloomed, it’s a double white. Gladiolas are in full bloom and so are the Cactus Dahlias. The first Cucumber and Sweet 100 Tomatoes should be ready to harvest soon.